A fable of a terrifying near future by critically acclaimed author Elizabeth Scott. 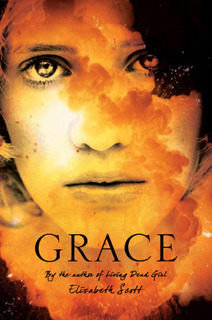 Grace was raised to be an Angel, a herald of death by suicide bomb. But she refuses to die for the cause, and now Grace is on the run, daring to dream of freedom. In search of a border she may never reach, she travels among malevolent soldiers on a decrepit train crawling through the desert. Accompanied by the mysterious Kerr, Grace struggles to be invisible, but the fear of discovery looms large as she recalls the history and events that delivered her uncertain fate. This is a really short story, but it packs a punch. As pieces of the world Grace lives in are revealed, the lives these people live become more and more disturbing. I love the awkward interactions between Grace and Kerr. This book could, under no circumstances, be described as a romance…but their short time together bonds them in a powerful way that will leave you thinking about them long after the book is over. While I do understand that the short length and the sparsity of details add to the mystery and horror of the story, I do really wish it had been longer. This could have been a Grade A Dystopian, as good or better than The Hunger Games. Instead, it remains just a small snapshot of another world. Even though I was very sympathetic to Grace and interested in her story, I wish there could have been more development and back story. Kerr definitely needed more development so that when the secret of his life is discovered it is more of a shock. So, while I did enjoy reading this, mainly I am just left dissatisfied and wanting more. When a reader wants more, it clearly indicates how good that book really is. I've read only one book by Scott and towards the end of that book, I also feel like there are more answers that I need answer for. This book really sounds like a fab read and I'm curious about this relationship between Grace and Kerr! Aww, that is a little frustrating to be left like that… I mean, it means it's good that you want to to know more, but on the other hand I like it when books stand for themselves. I'm still looking forward to reading this one, but I think I'll go into it expecting a bit more mystery and less resolution now. Good review! This story had some great emotional content but it needed a little bit more world building. Still, I liked the ending. I loved this one, but I do agree-it could have been a bit longer and I would have been very happy with that.